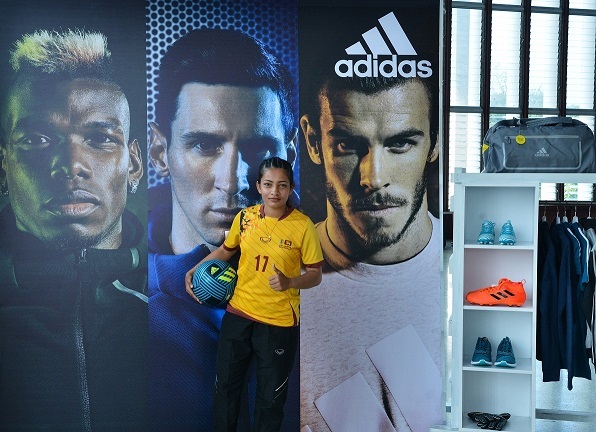 Tuesday 06th February 2018, Colombo: Adidas took great pride in participating in the historical FIFA World Cup Trophy Tour 2018 at an event held recently at BMICH in its capacity as the Official Partner for the FIFA World Cup Russia 2018. Sri Lanka kicked off the FIFA World Cup Trophy Tour as the trophy’s first international destination in its 51-country journey prior to the 2018 FIFA World Cup in June 2018. The FIFA World Cup Trophy Tour began its historic journey from Moscow’s Luzhniki Stadium (Russia) on September 9, 2017. President Maithripala Sirisena was officially handed the trophy on arrival in Sri Lanka, after which it was taken to the BMICH, where Prime Minister, Ranil Wickremesinghe, declared open the FIFA World Cup Trophy Tour for viewing by enthusiastic football fans. Sri Lankan fans thronged to participate in the exciting proceedings at BMICH. A colourful cultural welcome performance was staged by the Ministry of Tourism and soon after the Sri Lanka Football Association unveiled the country’s national Football Vision to further promote the game across the island. Adidas made its presence felt strongly at the BMICH event with an attractive stall showcasing all their upcoming football Footwear & Apparel collections for football fans at the venue. Being the most popular sport worldwide, football is clearly one of Adidas’ key strategic priorities. For over 60 years, Adidas has led all major developments in boot, ball and apparel technologies. This dedication to the sport and its close relationships with athletes and teams enabled Adidas to become an integral part of the history, the present and the future of football. The relationship between FIFA and Adidas dates back more than 40 years. Since 1970, Adidas has been supplying the official match ball for all FIFA World Cup™ matches. It goes without saying that for every FIFA World Cup™, Adidas designers and developers aim at devising the perfect ball by combining innovative technology and exciting and unique design to make the Official Match Ball the true icon of every FIFA World Cup™. Adidas partners include leading football associations (e.g. FIFA, UEFA) and their respective events (FIFA World Cup™, UEFA EURO 2012 & 2016, UEFA Champions League), national federations (e.g. reigning FIFA World Cup™ champion Spain, Germany, Argentina, Russia, Mexico, Japan, Denmark, Greece), leagues (e.g. Major League Soccer in the USA), clubs (e.g. Real Madrid, AC Milan, Chelsea FC, FC Bayern Munich) and individual players (e.g. three-time FIFA World Player of the Year Lionel Messi, Xavi, Thomas Müller, David Villa, Nani, Robin van Persie and David Beckham). The Adidas flagship store at Racecourse as well as Crescat, Rajagiriya, Pelawatte and Kandy bring the very latest in sportswear created by the world renowned Adidas brand to Sri Lankan customers. The Adidas range of shoes, clothes and accessories are available for men, women as well as serious sports athletes who want to up their game. As a company known for its innovation and commitment to perfection, the Adidas brand ensures every product lives up to their promise to change lives through sport.